Politico reports that the Trump administration is considering a major reorganization of the nation’s welfare programs, especially by shifting food stamps from the Department of Agriculture to the Department of Health and Human Services—and, in the process, renaming HHS. This is a very big deal—and, in some respects, a very good idea. Right now, it’s tough for eligible families to navigate the complex system that sprawls across multiple departments. A one-stop-shop, especially if it created a single point of contact for program recipients and one integrated database for program managers, would be a big step forward for everyone. Consider what we have now. At the Department of Health and Human Services, there’s Temporary Assistance for Needy Families (TANF), the traditional welfare program; Medicaid (which provides health care for the poor); and the Children’s Health Insurance Program (CHIP). The Treasury Department runs the Earned Income Tax Credit Program (EITC), which operates as a refundable tax credit through the income tax system. The Housing and Urban Development Department manages housing assistance programs through vouchers and provides payments to help lower-income individuals afford energy bills and weatherize their homes. And then there’s the Supplemental Nutrition Assistance Program (SNAP), managed by the Department of Agriculture along with child nutrition programs in the schools and community organizations. This sprawling empire costs $850 billion a year. And it’s one that badly needs attention. The reported plan would cut right to the heart of the most fundamental question of structuring the federal government. Should we organize the government by the function a program serves (like defense, foreign affairs, education, or energy)? Or should we organize by the people served (we have exactly one federal department organized by clientele: the Veterans Affairs Department). Students of public management will recognize that Luther Gulick served up these choices in his “Notes on the Theory of Organization,” which he prepared to help President Franklin D. Roosevelt reorganize the government back in 1937. When the federal government created the food stamps program in the Kennedy administration, putting it in USDA made a lot of sense. It was designed as a way to help farmers sell food—and for the poor to buy it at a discount. In fact, in the early days, the program worked by selling stamps to eligible families, which they could use in supermarkets. In the years since, the program has fundamentally changed. It’s focused on helping the poor afford nutritious food, instead of marketing food products. And since the 1990s, it’s relied on electronic benefit cards instead of stamps. With those changes, there’s no reason why SNAP needs to be in Agriculture—except for history, tradition, defense of the USDA core budget and, perhaps most important, the fact that the Agriculture Committees on Capitol Hill have jurisdiction over it. There is a really good reason for operations and citizens to combine it with the other means-tested programs. The inevitable battle over congressional jurisdictions, however, could scuttle the plan before it even sets sail. Even with the enormous support that stood behind the creation of the Homeland Security Department, congressional jurisdictional battles continue to cripple its operations. DHS officials find themselves torn between 120 different congressional committees, subcommittees, task forces, and commissions. But the congressional jurisdictional questions are only part of the looming debate over reorganizing SNAP. There are reports that HHS would be renamed in the process, to include “welfare” in the title. We’ve been there before. In 1980, the Department of Health, Education, and Welfare became the Department of Health and Human Services, when Education was split off into its own department—and when the Carter administration wanted to strike “welfare” from the title. There’s the rub. There’s nothing fundamentally wrong with bringing welfare programs together. But combining them could make the programs a far bigger target, and applying the “welfare” label could build support for cutting them. 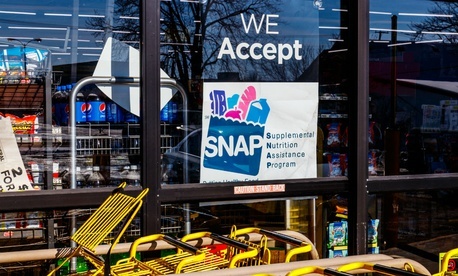 The Heritage Foundation, for example, targeted SNAP in its 2017 report in its analysis “to terminate or significantly reform federal agencies and programs that function outside of the federal government’s core constitutional responsibilities.” One of its proposals: move SNAP to HHS. Relatively few Americans favor making cuts to programs for the needy in the country: 37 percent of Republicans and 6 percent of Democrats, according to a 2017 Pew Research Center survey. But that could change if the programs became a bigger target. Bringing together the federal government’s programs for the needy could make them easier for the poor to navigate, and that would be a big plus. Even more important would be improving the way they’re managed. They’re a morass of improper payments. But there well could be far more going on here than that: creating a tighter, easier-to-hit target. The administration now has an opportunity for making a big improvement in government—or for picking a fight that might make that impossible. Reorganization, of course, is never just about management improvements. It’s always also about symbols and politics. The coming weeks will show what the Trump administration’s fundamental goals are. Donald F. Kettl is Professor in the Lyndon B. Johnson School of Public Affairs, University of Texas at Austin, located at the LBJ Washington Center.